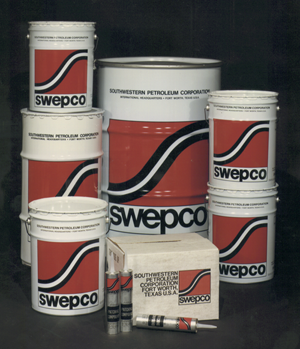 The Southwestern Petroleum Product Line, marketed under the brand name “SWEPCO”, includes a wide range of cold process products and systems designed for the maintenance and replacement of low slope commercial, industrial and institutional roofs. These include protective coatings, primers, sealers, reinforcing membranes and patching materials. SWEPCO “cold process” roofing products are different from ordinary roofing materials ... different because they contain such unique ingredients as “Heart of Texas” Asphalt, special High Strength Micro Fibers, Zonamine, ZHD-7, Dia-Seal and finely milled Blue/Black Slate. Together, these ingredients result in products of unmatched performance. Our roofing products are supplemented with a broad range of high-performance products designed for maintenance of floors, walls, metal and pavement. We believe maintenance of existing property with high quality maintenance materials is more cost effective than neglect and eventual replacement. And, because much of the cost of commercial and industrial maintenance goes to the labor required to install the products, we believe it makes good sense to specify the best products available so maintenance has to be performed less frequently. These messages are well received in the marketplace and are one of the reasons for our continuing growth. SWEPCO Products & Systems enjoy wide customer acceptance because they deliver the benefits property owners and managers are looking for…long service life, reduced application costs, energy savings, reduced maintenance costs, environmentally friendly formulations and freedom from problems. SWEPCO Products and Systems are manufactured under stringent quality assurance systems which have been certified ISO 9001 compliant. SWEPCO Products are made with the very best ingredients modern technology can supply. We then process those ingredients according to our own proprietary formulations with our own staff in our own plants with our own quality assurance technicians verifying every step. We have total control and we use it to produce the finest products money can buy.